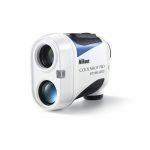 These days, laser rangefinders for golf are equipped with the latest tech for even cheaper prices. Trust us when say the Golfbuddy LR7 is feature-packed without being too fancy or expensive. It has just the right balance between state-of-the-art performance and a user-friendly interface. It’s a compact and lightweight rangefinder with 6x magnification and a 23 mm objective lens. The optics are multi-coated for great performance and bright displays. The LCD display shows distances in black in either yards or meters. But, the real difference between the LR7 and all other rangefinders are the multiple targeting modes. There are four in all: Standard, Scan, Pin, and Pin Finder modes. 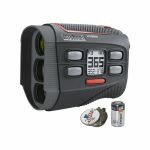 Each target mode has their place in the sport, and because of its versatility, this rangefinder can be used for other things too – hunting, surveying, architectural purposes, and more. However, on the green you need those distances to the front, center, and back. You might also want distances to bunkers, sand traps, and ponds. Knowing the distance can help you choose your club and swing technique wisely. Since this isn’t a GPS unit, you’ll be able to use this rangefinder for several rounds. No more rushing through rounds or taking a break to charge up your unit. Just turn it on, and you’ll have 2000-4000 actuations at your disposal before you need a battery replacement. Helping to save battery life during rounds or bathroom breaks, the LR7 will automatically shut down after 10 seconds of the last use. Feel free to range and forget! This mode is as simple as it can be – gives the distance. You’ll have the line of sight distance to whatever target you aim at. This is obviously convenient for golf, but it will also be great to use in hunting and surveying. This mode requires only one press of the fire/range button to get distances to multiple targets for 10 seconds as you scan the terrain/course. Pin mode just like Scan mode, however, it will provide distances to the closest targets for 10 seconds. What is Pin Finder Mode? Pin Finder is just like Pin mode; however, it will also vibrate for confirmation on distance yardage with the closest target. What Battery does the LR7 take? The rangefinder requires a CR2 3V lithium battery. How Accurate is the Golfbuddy Laser Rangefinder? The LR7 rangefinder is guaranteed to be accurate within +/-1 yard. 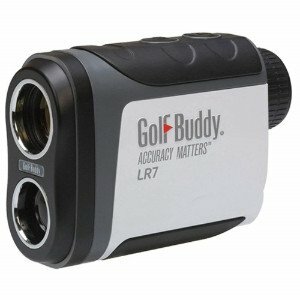 How to Troubleshoot the Golfbuddy LR7? If the display is having issues, take the battery out and ensure it’s reinserted correctly with the appropriate polarity. Double check that the battery isn’t dead or drained. Lastly, press the power button firmly. If you can’t acquire a distance reading, make sure it’s powered on. You should see a reticle in the center of the display. Double check to see the lenses are unobstructed, and don’t range past the maximum yardage of 880 yards. Does the LR7 have Slope? This rangefinder is a tournament legal device, and it does not provide slope measurements. 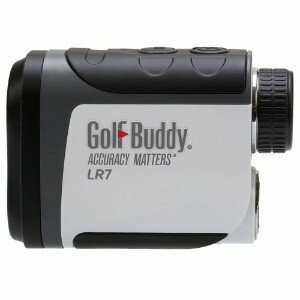 GolfBuddy did recently release their LR7S model which is the slope version of this rangefinder. 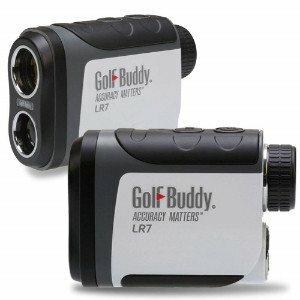 Does the Golf Buddy Rangefinder come with Accessories? Yes! The LR7 comes with a carry case, included CR2 battery, strap, microfiber cloth, and quick start guide. Can the Laser Rangefinder be Worn? A strap is included, and the rangefinder has an eyelet to loop the strap through. What is the Golf Buddy Warranty? The LR7 comes with a 1-year warranty from the date of purchase. Keep your receipt. If a claim is covered under the warranty, they will repair or replace your LR7 at no cost to you. However, don’t attempt to get it repaired by anyone else but a Golfbuddy technician. To ping up the strokes, the Golfbuddy LR7 laser rangefinder is a smart, nifty thing. It has the latest tech that makes it a versatile tool for all sorts of measuring, but especially for driving the green. You won’t have to switch between devices for practice and tournaments since this is a 2-in-1 rangefinder – totally tournament legal. But, if you want a Golfbuddy device that’s even smaller and more discrete, the Voice 2 is the way to go. It’s not a laser rangefinder, it’s a GPS handheld unit, and it talks. It will read aloud the distances to the front, back, and center of the green as it automatically goes to the next hole as you drive/walk there, and it has a Dynamic Greenview feature. Guess what else? It’s cheap! However, there’s no debate that a laser rangefinder will last longer, and it won’t die out on you during the middle of a round. If you want a little more yardage and an extra year of warranty coverage, consider the Bushnell Tour 4. It’s competition compliant, so it doesn’t have slope, and it has the Jolt feature that will vibrate to confirm a distance reading. The LR7 has everything a golfer could want in a tournament legal rangefinder. It has more target modes than we think you’ll really use, but it sure is nice to have it for under $200!